Georgetta Dune and her husband Corneliu are from Romania. He is a winemaker and Georgetta has a masters’ degree in food science. Together they started their own wine making business. One night, at a dinner party with a group of friends, they applied on a whim for the U.S. green card lottery. The odds were 30,000 to one on winning. Luck was with them and on the day they were baptizing their daughter the news came that they had won. The only person they knew in America was in Monterey California so that is where they went. Luck was still with them as Kendall Jackson was building a new winery. Corneliu got a job as a cellar rat and Georgetta as a lab technician. Within a year Corneliu became the enologist. In 2006 Georgetta became the wine maker or as she likes to say the “warden” of the Big House wine company. Big House is located near the Soledad prison and the company was started by Randall Grahm. 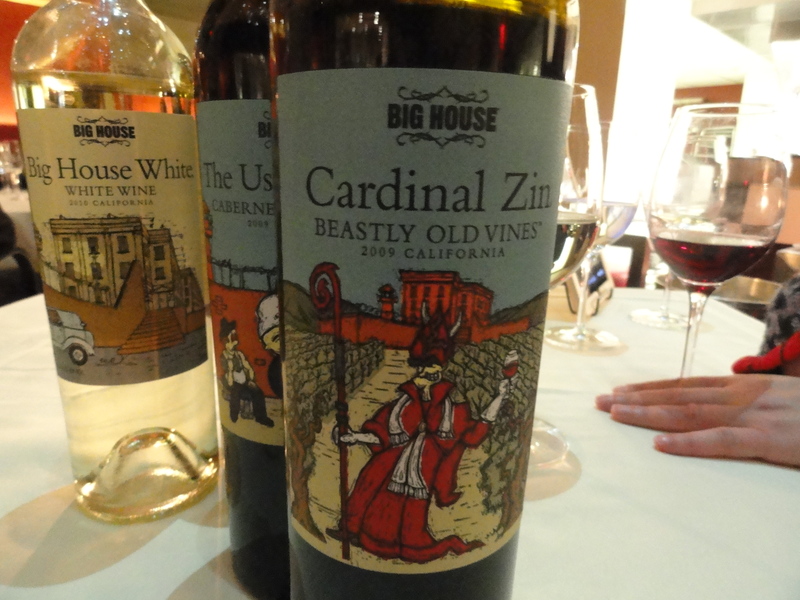 I guess he could not resist naming the winery Big House. Georgetta said that when she came to Big House they were crushing 42 different varieties of grapes and she brought order by making the 42 varieties into individual lots. She said that she thinks of herself as a winemaker as if she were a perfume maker – that is, making a base wine and adding “the essential oils” to make it work, adding the different grapes to the base wine until she gets the right blend. She pointed to the Big House white as an example. When she first tasted the wine, she believed it was over the top. It reminded her of cheap perfume and it was made from three aromatic grapes: Malvasia Bianca, Muscat and Viognier. After trying a number of different grape varieties, she added Pinot Grigio and Gruner Veltliner for the middle note and to add some depth. The top note was Gewurztaminer for rose petals. Now she had the aroma and taste that she wanted. We met for dinner at SD 26 to talk and to taste her wines. I found her very interesting and knowledgeable. She was also very honest in explaining how she made her wine. Sometimes wine makers will not disclose certain methods that they use or will tell you what they think you want to hear. 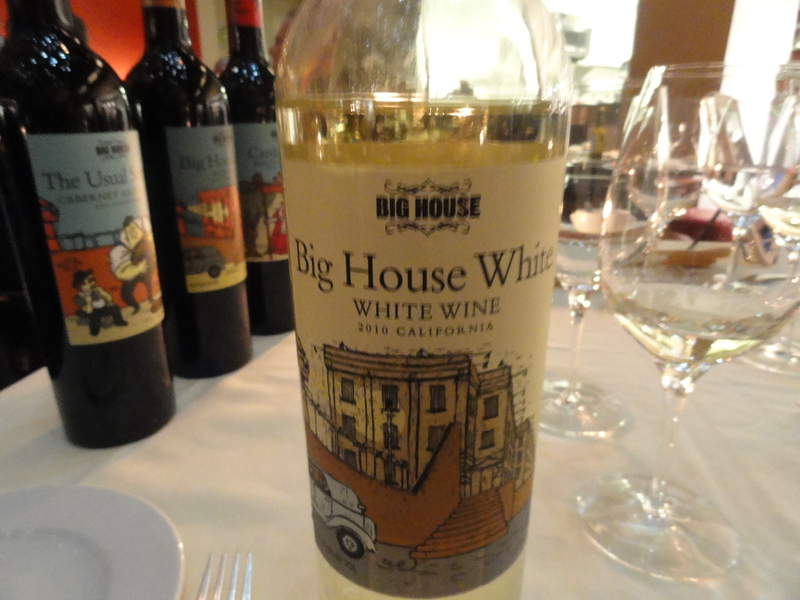 Big House White 2001 It is a blend of many different grapes: 22% Malvasia Bianca, 15.9% Gruner Veltliner, 15.7% Sauvignon Blanc, 9.2% Gewurtraminer.7.9% Riesling, 7.3% Chenin Blanc, 6% Muscato Canelli,5’2% Viogner,4.5% Verdelho,4.4% Albarino and 1.1% Pinot Grigio. Brix at harvest 21.0-24.0, the grapes are picked at night and cold fermentation takes place in stainless steel tanks and the wine does not undergo malolatic fermentation. 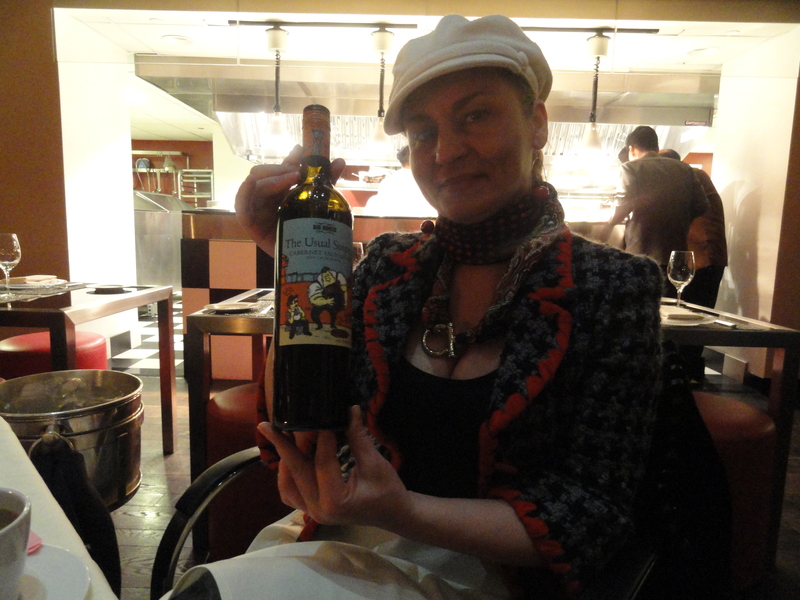 Georgetta explained that this maximized the fresh fruit flavors and lets the wine retain a crisp acidity. The wine was aromatic, easy to drink with fresh fruit aromas and flavors and hints of white peaches and a touch of tropical fruit. I was surprised by the long finish. The wine does not remain on the lees because the grapes used would produce a bitter wine. Unchained “Naked” Chardonnay 2010 100% Chardonnay– the grapes are picked at night or early in the morning. Harvested at 22.0-24.0Brix. Cold fermentation in stainless steel tanks and as Georgetta put it, the wine is free from the common secondary malolatic fermentation which is a frequent “sentence” for California Chardonnay. Gerogetta loves the term “naked” because it allows her to create a Chardonnay free from the confines of oak barrels. It is a fresh and bright unoaked Chardonnay that is more like an aromatic white than a California Chardonnay. It is very crisp with hints of green apple and pear. 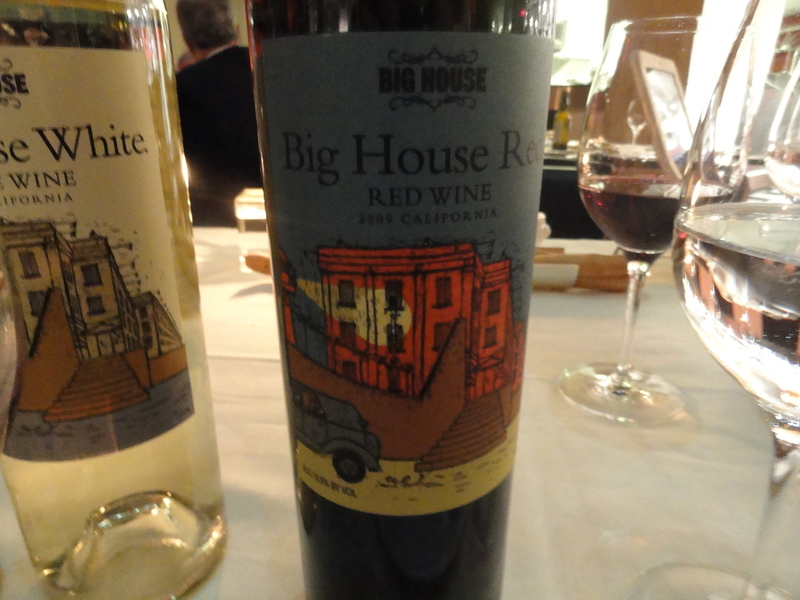 Big House Red 2009 is a blend of 27% Petite Sirah, 14.5% Syrah, 8.6% Barbera, 6.4% nero d’Avola, 6.1% Tempranillo, 3.3% Malbec, 2.4% Aglianico, 2.4% Souzao, 2.3% Charbono, 2.2% Petite Verdot, 2.1% Cabernet Franc, 2% Tannat, 12.5% other Esoteric Reds. Harvested at 23.0-28.0 Brix. The grapes were cold soaked for a few days and were fermented at 60-65 degrees. Part of the bled underwent malolatic fermentation. The wine was aged for a time mostly in French and American neutral oak. Georgetta said that they were barriques but were three years old or older and she does not want her wine to taste like wood. The wine was fruity with hints of cherry and spice and a touch of vanilla, perhaps a touch too much for me. 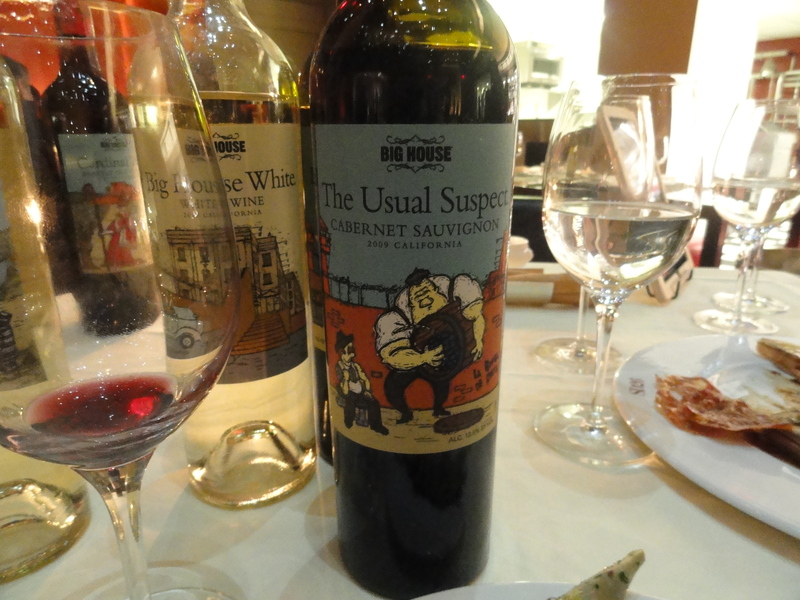 The Usual Suspect 2009 100% Cabernet Sauvignon 90% Cabernet Sauvignon and 10% Grenache. Harvested at 24.0-26.0 Brix. Gerogetta said that she tried a number of different grapes to blend with the Cabernet but none seemed as good a match as the Grenache. Georgetta said that this wine was made and aged the same as the other red wines but I did not find that touch of vanilla. It was an easy drinking wine with good body and the addition of Grenache made it more aromatic. This was a perfect combination with the roast goat and potatoes that I had ordered. Cardinal Zin 2009 80% Zinfandel, 10% Mourvedre, 8% Carignane, 2% Petite Sirah. The grapes were harvested at 26 Brix and higher. Georgetta said that in order to bring down the alcohol level she added water to the wine which is legal in California. The tiny grapes were cold soaked and fermented in cool stainless steel tanks and then malolatic fermentation took place. It was aged the same way as the other red wines. There were hints of blackberries, spice and a lightness that is unusual in a Zinfandel. I enjoyed it with the rest or the goat. All the wines have screw caps and all sell for $10. They are also available in a box and Georgetta said that it is the same wine that is in the bottle.